Three days in Salzburg gives you time to enjoy its landmarks and culture, and also cast your net into the nearby Austrian and German Alps. From touring the area’s Sound of Music locations and Salzburg’s Mozart museums to delving into salt mines and lakeside villages, here’s how to spend three days in and around Salzburg. Blessed with baroque architecture and a music and movie heritage rooted in Mozart and The Sound of Music, Salzburg offers many attractions. Take a hop-on hop-off tour to see all its sights in single loop, or disembark at the stops to explore star attractions such as St. Peter’s Abbey (Stift Sankt Peter) and the Getreidegasse shopping street. Or, perhaps drill deeper into Old Town and Salzburg Fortress (Festung Hohensalzburg) by joining a shared or private guided walking tour. Next, zoom in on Salzburg’s specialities. Prebook entry to Mozart’s Birthplace (Mozart Geburtshaus) and Mozart’s Residence (Mozart Wohnhaus)—both once home to the composer. Or, join an all-singing Sound of Music coach tour around the movie’s settings. Austria’s Salzkammergut lake district and Germany’s Bavarian Alps both lie near Salzburg. Private and group day trips to Bavaria’s Alps abound, with most focusing on the Eagle’s Nest—the former mountaintop retreat of Adolf Hitler. Many also encompass the region’s centuries-old salt mines and pristine mountain-framed King’s Lake (Königssee). Alternatively, take a tour to the jewel-like Austrian lakeside village of Hallstatt with its Alpine houses, salt mine, and views. Also within easy reach is the lakefront village of St. Wolfgang. Tours here often include a lake cruise or time in nearby Hallstatt to double down on the Alpine scenery. It’s time for a bigger bite into Salzburg’s culture. Perhaps discover the art of making one a local sweet treat—apple strudel—at a cooking class. Or, if it’s Christmas, combine strudel-making with Christmas cookies. Other festive experiences that beckon in winter include a Christmas horse-drawn sleigh ride in the snowy countryside and a tour of Salzburg’s Christmas markets. Whatever the season, spend your last evening at one of Salzburg’s glittering dinner concerts. Book ahead for dinner in the Baroque Hall of St. Peter where guests are serenaded by singers performing Mozart. Or, take a seat for a Mirabell Palace (Schloss Mirabell) concert or puppet show at Salzburg’s Marionette Theater—both fitting finales. Relive your favorite scenes from the classic musical "The Sound of Music" on this Salzburg sightseeing tour. Visit filming sites around the city while your guide provides historical background on Salzburg’s top attractions and architectural jewels, including the gazebo where "Sixteen Going on Seventeen" was shot. Discover the magic of the alpine region of Salzkammergut on this 5.5 hour coach tour of Hallstatt, departing from Salzburg.At Hallstatt you have about 2.5 hours free time.Take a walk along a lake in a historic village, see the Muhlbach Waterfall , visit the museums and the famous bone house.Optional take a ride with the cable car to the Hallstatt World Heritage Skywalk towering 380 meters above. A guide will fill you in on the region’s history on you ride to Hallstatt, stopping for views the spectacular mountain ranges. Nature buffs won't want to miss this experience. Soak up the scenery of Austria’s Lake District on this 4-hour tour from Salzburg. Led by an expert guide, visit Fuschl Castle, wander the town of St Wolfgang and pop into the famous White Horse Inn for refreshments. Enjoy a boat ride across Lake Wolfgang and explore St Gilgen before making your way back to Salzburg. Get a comprehensive overview of Salzburg's attractions during this hop-on hop-off bus tour. Listen to the onboard commentary in 13 languages, then hop off at any one of the 12 stops to explore further on your own. Two-day and day ticket options available to suit your budget and schedule. Explore the historic city of Salzburg on a 2-hour walking tour. Led by an expert guide, learn the stories behind the city's architectural gems and famous residents, such as the Von Trapp family and Mozart. Pass St Peter’s Monastery, Mozart House and the Mirabell Gardens, when scenes from ‘The Sound of Music’ were filmed. You’ll also have the chance to explore the Baroque Old Town, dotted with stunning cathedrals and churches. 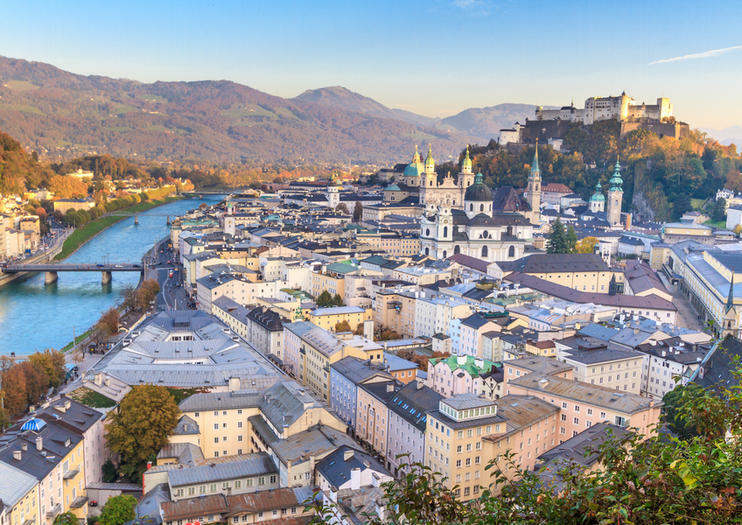 Gain insight into the Gothic, Renaissance and Baroque architecture of Salzburg as Mozart saw it on this 2.5-hour sightseeing tour. Led by an expert guide, explore the sights by coach before heading into Mozart’s Residence. Wander the famous composer’s former abode and visit the exhibits at your leisure, as your city tour ends here. Enjoy fun for all the family at Salzburg Marionette Theater. You won’t have to worry about wasting time in long visitor lines as entrance tickets are included. If you’re traveling with children, this is the ideal solution to keep them entertained, as The Magic Flute is catered for both kids and adults alike. You’ll see talented puppeteers performing Mozart’s incredible opera, which is full of singing, dancing, and lots of surprises. History-buffs will find it hard to resist this customizable private tour from Salzburg. After private pickup from your hotel, you and your guide set off for Adolf Hitler’s World War II lairs in the Bavarian Alps. Visit Lake Königsee along with an underground 500-year-old salt mine. The tour is worth it for the scenic route alone, but you’ll enjoy much more over your six-hour adventure. The holidays are usually filled with good food, and this Christmas cooking lesson in Salzburg combines food and fun to give you a rewarding cooking experience. Test out your skills making traditional Austrian apple strudel and Vanilla Kipferl cookies. Get into the holiday spirit with others as you make these delicious treats. Plus take a lunch break to slurp down some hot goulash soup. If you don't eat all the cookies you've made, you're also welcome to take them home with you at the end of the day. Spend wintertime in Salzburg on this Christmas markets tour in Austria. Make your way through multiple festive markets decked out in holiday cheer, and shop for Christmas gifts (own expense). Along the way, hear stories about Austria’s Christmas traditions, and visit the cathedral where the Christmas carol ‘Silent Night’ was written, as well as the Christmas Museum of Salzburg.